user warning: Table './active5_foxes/cache_filter' is marked as crashed and should be repaired query: SELECT data, created, headers, expire, serialized FROM cache_filter WHERE cid = '2:f692924f722783172c256f8124a57d7f' in /home/active5/public_html/drupal6_multisite/includes/cache.inc on line 25.
user warning: Table './active5_foxes/cache_filter' is marked as crashed and should be repaired query: UPDATE cache_filter SET data = '<p class=\"rtecenter\"><img alt=\"\" src=\"http://www.catchingfoxes.com/sites/www.catchingfoxes.com/files/resize/blog/IMG_2100-486x362.jpg\" style=\"width: 486px; height: 362px; border-width: 5px; border-style: solid; margin: 10px;\" title=\"\" width=\"486\" height=\"362\" /></p>\n<p>One of the most frequently asked questions regarding Nathaniel is &quot;Will they be able to fix his airway?&quot; Up until a few months ago, we answered with a confident yes. When we first met Nathaniel through his adoption case manager, everything indicated that airway reconstruction surgery was possible and would likely happen around age two. Over the last year, it became apparent that age two was a lofty goal. Nathaniel&#39;s airway did not grow and change as doctors expected. &quot;Surgery maybe in 2015,&quot; was the next target mentioned and became our answer when asked about his prognoses. As of today and meeting with Nathaniel&#39;s doctors, we will begin answering that question differently. &quot;We do not know yet if Nathaniel&#39;s airway can be reconstructed.&quot;</p>\n<p>The game changer is aspiration.</p>\n<p>Airway reconstruction surgery will open up the passageway to Nathaniel&#39;s lungs. Currently the significant stenosis and webbing is actually preserving Nathaniel&#39;s lung health. I can not look at Nathaniel without marveling at the truth of Psalm 139:14. &quot;I will praise you God, because Nathaniel is fearfully and wonderfully made. Wonderful are Your works...&quot; We praise God for the severity of abnormality? Yes. Aspiration with only a thirty or forty percent blockage might look very different. Possibly more pneumonia. More concern about his frequent vomiting. Perhaps more hospitalizations. We praise God for the protection He put in place when creating Nathaniel.</p>\n<p>Everything considered - airway, feeding routines, lung health - Nathaniel is in the best place he can be right now. There is nothing the doctors can offer to make quality of life better or care giving easier.</p>\n<p>In fact, this place - critical airway tracheostomy, no oral feeds, completely g-tube dependent - might be the best choice for Nathaniel for his whole life. Changing direction toward a different path requires a change in aspirating or more devastating surgeries and options.</p>\n<p>Nathaniel will need to be much much older before a therapist can attempt to remediate his swallow. It is unclear now if that will ever be possible. &quot;Fully cognitive adults struggle to remediate their swallow pattern,&quot; cautioned the therapist yet again yesterday when I called to ask a few more questions.</p>\n<p>So where are we? How do we process this news as parents and as a family?</p>\n<p>First, we commit again to the Calculus Factor for one of our children. I coined the term years ago when one of our children questioned taking Calculus 3. The student had achieved an A in Calculus 1 and Calculus 2, but was not sure if she wanted to do the work for the next level of math. I pushed for enrolling in Calculus 3. &quot;You are succeeding,&quot; I lectured. &quot;If you stop when you are succeeding, you will never know your full potential. Do not decide in a moment of success to close doors to opportunity. Push until failure forces those doors closed. Then walk through the ones still open.&quot; She took Calculus 3. It was a hard semester for our child and hard to watch her be stretched. But the experience shaped us as parents and deepened our understanding of the role of failure in our children&#39;s lives. (By the way - she went on to take Differential Equations too.) Until doors close for Nathaniel, we push him through and toward the success he is experiencing daily. Even if it is hard for him. Even if it is hard for us.</p>\n<p>Second, and far more important than our confidence in our own or Nathaniel&#39;s strength, we have great confidence in a God who knows, sees, and does not forsake His children. I was reminded recently that even as God disciplined His chosen nation in the Old Testament, He did not leave them alone in that punishment. He went before and behind them. Always, always, always committed to bring them to a place of healing and redemption. We have seen God work in Nathaniel&#39;s life. We have seen Him provide and protect. We have seen miracles. We count it a privilege to love this little boy through his struggles, confident that God sees our needs as well. We are in awe that our front row seat to Nathaniel&#39;s journey deepens our understanding of God&#39;s character.</p>\n<p>Mostly, we will pray for a miracle of healing Nathaniel&#39;s aspiration.</p>\n', created = 1555820017, expire = 1555906417, headers = '', serialized = 0 WHERE cid = '2:f692924f722783172c256f8124a57d7f' in /home/active5/public_html/drupal6_multisite/includes/cache.inc on line 108.
user warning: Table './active5_foxes/cache_filter' is marked as crashed and should be repaired query: UPDATE cache_filter SET data = '<p class=\"rtecenter\" style=\"\"><a href=\"http://www.facebook.com/CatchingFoxes\" target=\"_blank\"><img alt=\"\" src=\"/sites/www.catchingfoxes.com/files/resize/social/facebook-64x64.png\" style=\"text-align: center; width: 64px; height: 64px; \" width=\"64\" height=\"64\" /></a><a href=\"http://pinterest.com/kimmrankin/\" target=\"_blank\"><img alt=\"\" src=\"/sites/www.catchingfoxes.com/files/resize/social/big-p-button-64x64.png\" style=\"width: 64px; height: 64px; \" width=\"64\" height=\"64\" /></a><a href=\"mailto:kim@catchingfoxes.com\" target=\"_blank\"><img alt=\"\" src=\"/sites/www.catchingfoxes.com/files/resize/social/mail-64x64.png\" style=\"width: 64px; height: 64px; \" width=\"64\" height=\"64\" /></a><a href=\"http://www.catchingfoxes.com/rss.xml\" target=\"_blank\"><img alt=\"\" src=\"/sites/www.catchingfoxes.com/files/resize/social/rss-64x64.png\" style=\"width: 64px; height: 64px; \" width=\"64\" height=\"64\" /></a></p>\n', created = 1555820017, expire = 1555906417, headers = '', serialized = 0 WHERE cid = '2:48be9f28bc948ea32b70445d0a590c98' in /home/active5/public_html/drupal6_multisite/includes/cache.inc on line 108.
user warning: Table './active5_foxes/cache_filter' is marked as crashed and should be repaired query: UPDATE cache_filter SET data = '<div class=\"fb-like\" data-font=\"verdana\" data-href=\"http://www.facebook.com/CatchingFoxes\" data-send=\"false\" data-show-faces=\"true\" data-width=\"280\">\n	&nbsp;</div>\n', created = 1555820017, expire = 1555906417, headers = '', serialized = 0 WHERE cid = '2:854065b9b61ff8596c8fa62e384317c7' in /home/active5/public_html/drupal6_multisite/includes/cache.inc on line 108.
user warning: Table './active5_foxes/cache_filter' is marked as crashed and should be repaired query: UPDATE cache_filter SET data = '<p><strong>Catch for us the foxes, the little foxes that ruin the vineyards, our vineyards that are in bloom. </strong><br /><em>Song of Solomon 2:15 NIV</em></p>\n<p>Metaphorically, the &quot;foxes&quot; are the damaging attitudes and actions that can creep in and threaten the love relationship of a couple and a home. &nbsp;Catching Foxes is committed to being a resource as you guard against the things that might injure and destroy the harvest you are striving to grow in your home.</p>\n', created = 1555820017, expire = 1555906417, headers = '', serialized = 0 WHERE cid = '2:132a8457abcc78748ef29251eaa8f1d7' in /home/active5/public_html/drupal6_multisite/includes/cache.inc on line 108.
user warning: Table './active5_foxes/cache_filter' is marked as crashed and should be repaired query: UPDATE cache_filter SET data = '<p><a href=\"mailto:kim@catchingfoxes.com\">kim@catchingfoxes.com</a></p>\n', created = 1555820017, expire = 1555906417, headers = '', serialized = 0 WHERE cid = '2:fe7b2055d10a2c25c439ca4710d86502' in /home/active5/public_html/drupal6_multisite/includes/cache.inc on line 108. One of the most frequently asked questions regarding Nathaniel is "Will they be able to fix his airway?" Up until a few months ago, we answered with a confident yes. When we first met Nathaniel through his adoption case manager, everything indicated that airway reconstruction surgery was possible and would likely happen around age two. Over the last year, it became apparent that age two was a lofty goal. Nathaniel's airway did not grow and change as doctors expected. "Surgery maybe in 2015," was the next target mentioned and became our answer when asked about his prognoses. As of today and meeting with Nathaniel's doctors, we will begin answering that question differently. 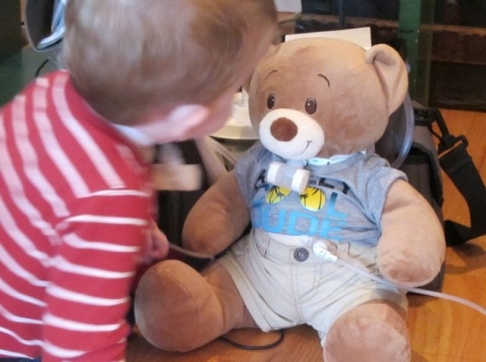 "We do not know yet if Nathaniel's airway can be reconstructed." The game changer is aspiration. Airway reconstruction surgery will open up the passageway to Nathaniel's lungs. Currently the significant stenosis and webbing is actually preserving Nathaniel's lung health. I can not look at Nathaniel without marveling at the truth of Psalm 139:14. "I will praise you God, because Nathaniel is fearfully and wonderfully made. Wonderful are Your works..." We praise God for the severity of abnormality? Yes. Aspiration with only a thirty or forty percent blockage might look very different. Possibly more pneumonia. More concern about his frequent vomiting. Perhaps more hospitalizations. We praise God for the protection He put in place when creating Nathaniel. Everything considered - airway, feeding routines, lung health - Nathaniel is in the best place he can be right now. There is nothing the doctors can offer to make quality of life better or care giving easier. In fact, this place - critical airway tracheostomy, no oral feeds, completely g-tube dependent - might be the best choice for Nathaniel for his whole life. Changing direction toward a different path requires a change in aspirating or more devastating surgeries and options. Nathaniel will need to be much much older before a therapist can attempt to remediate his swallow. It is unclear now if that will ever be possible. "Fully cognitive adults struggle to remediate their swallow pattern," cautioned the therapist yet again yesterday when I called to ask a few more questions. So where are we? How do we process this news as parents and as a family? First, we commit again to the Calculus Factor for one of our children. I coined the term years ago when one of our children questioned taking Calculus 3. The student had achieved an A in Calculus 1 and Calculus 2, but was not sure if she wanted to do the work for the next level of math. I pushed for enrolling in Calculus 3. "You are succeeding," I lectured. "If you stop when you are succeeding, you will never know your full potential. Do not decide in a moment of success to close doors to opportunity. Push until failure forces those doors closed. Then walk through the ones still open." She took Calculus 3. It was a hard semester for our child and hard to watch her be stretched. But the experience shaped us as parents and deepened our understanding of the role of failure in our children's lives. (By the way - she went on to take Differential Equations too.) Until doors close for Nathaniel, we push him through and toward the success he is experiencing daily. Even if it is hard for him. Even if it is hard for us. Second, and far more important than our confidence in our own or Nathaniel's strength, we have great confidence in a God who knows, sees, and does not forsake His children. I was reminded recently that even as God disciplined His chosen nation in the Old Testament, He did not leave them alone in that punishment. He went before and behind them. Always, always, always committed to bring them to a place of healing and redemption. We have seen God work in Nathaniel's life. We have seen Him provide and protect. We have seen miracles. We count it a privilege to love this little boy through his struggles, confident that God sees our needs as well. We are in awe that our front row seat to Nathaniel's journey deepens our understanding of God's character. Mostly, we will pray for a miracle of healing Nathaniel's aspiration.